Poor Clare and mystical writer, born at Bologna, 8 September, 1413; died there, 9 March, 1463. When she was ten years old, her father sent her to the court of the Marquis of Ferrara, Nicolr d'Este, as a companion to the Princess Margarita. Here Catherine pursued the study of literature and the fine arts; and a manuscript illuminated by her which once belonged to Pius IX is at present reckoned among the treasures of Oxford. After the marriage of the Princess Margarita to Roberto Malatesta, Prince of Rimini, Catherine returned home, and determined to join the little company of devout maidens who were living in community and following the rule of the Third Order of St. Augustine in the neighboring town of Ferrara. 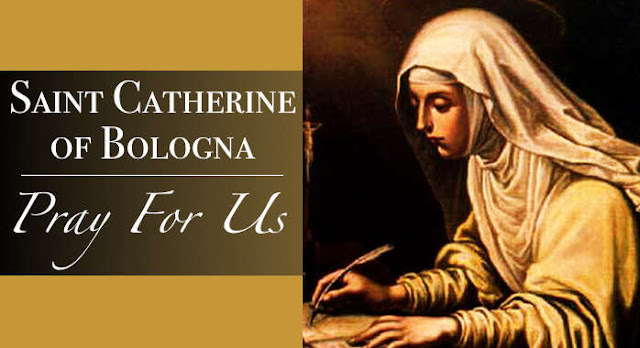 Prayer to St. Catherine: Dear saintly Poor Clare, Saint Catherine of Bologna, so rich in love for Jesus and Mary, you were endowed with great talents by God and you left us most inspiring writings and paintings for wondrous beauty. You did all for God’s greater glory and in this you are a model for all. Make artists learn lessons from you and use their talents to the full.